Instant cold pack activates easily to deliver immediate relief whenever cold therapy is required. Its cooling properties provide an anesthetic effect to quickly relieve your aches and pains. Unitized box fits conveniently into a first aid kit or cabinet (each sold separately). 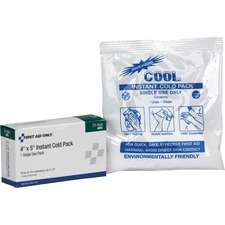 Cold pack is perfect for soothing pain caused by minor sprains, strains, bruises and more.